Explore the reserve to find out more about our wildlife mums that are busy looking after their families at Brockholes Nature Reserve. There’s a Mother’s Day Treat for those completing the trail. Admission is £3 per trail pack. Each trail pack includes a Brockholes pencil and a chocolate treat on completion. This is a drop in activity with no need to book. Just come along and pick up your pack from the Welcome Centre located on the floating Visitor Village. Car parking charges apply. An evening of poetry and music in partnership with Lancaster Litfest to celebrate their 40th Anniversary. Roger McGough, one of Britain’s best-loved poets, is the author of over seventy books of poetry and editor of numerous anthologies. Exuberant new collection joinedupwriting ranges from forgotten friendships and the idiosyncrasies of family life to the trauma of war and contemporary global politics. It’s at Lancaster University from 7pm. Tickets from £16.50. Lytham St. Annes Choral Society, Kirkham Grammar School Choir and the Helios Symphony Orchestra perform Mendelssohn’s Elijah with soloists Nicola Howard, Joyce Tindsley, Nick Hardy and John Anthony Cunningham. Conducted by Helen Harrison. Starts at 7.30pm at Kirkham Grammar School on Ribby Road, Kirkham. Tickets are £11 in advance or £12 on the door. Available from Kirkham Grammar School (Reception), Plackitt and Booth, Mike Stuart Travel and ZPQ Designs - all in located Lytham St Annes. Knowledgeable and passionate guided walk leaders will point out lots of the interesting wildlife and plant life found in the dunes at Lytham St Annes, talk about why dunes are so important and about all of the conservation work happening on the Fylde Coast. Walks usually last about two hours and sturdy footwear is recommended. Meet in North Beach Car Park (by the coastguard station) at 10am. These walks are run as part of the Fylde Sand Dunes Project. For more details call 07860 954290. Broughton and District Club’s two new courts will be opened by John “Gilly” Gilmore of Radio Lancashire at 13.30. The opening will be followed by a Family Fun Day of Tennis. This will include: Family play, junior coaching, mini tennis, ball machines - including Nadal’s “Ace Attack” machine, cardio tennis, and exhibition tennis by some of their best players. Equipment provided. Refreshments available. Runs from 1.30pm until 4pm at the Whittingham Lane venue. Take your little builders along for special animal-themed LEGO® workshops with Master Builder Bricks McGee at the Harris Museum and Library. Be inspired by Horace the Elk in Discover Preston, or by the wonderful new animal-themed displays in the Children’s Space in the library to create your own LEGO® animals. Let your creativity and imagination run wild. The same one-hour workshop will run four times on Saturday. The sessions are aimed at children aged approx between five and 12 years. Tickets are £2. Grown-ups to stay, but do not need a ticket. Booking must be through Eventbrite. 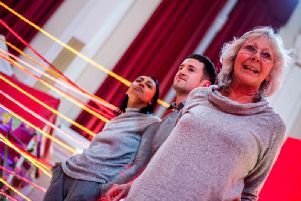 Extend: Inclusive Dance is a programme of inclusive technique classes exploring different styles of dance. These sessions are perfect for both beginners and those with experience. These sessions will run at Plungington Community Centre on Mondays at a cost of £7 each. No need to book - just turn up. Take part in this study evening with two stories at the Lancashire Infantry Museum. First there will be the story of Frogman ‘Buster’ Crabb and his demise in 1966, told by expert naval historian James Heyworth. Then there will be the tale of the Persian Gulf Pirates told by Lieutenant Colonel John Downham when the 47th Foot (later 1st Loyals) were heavily involved. Takes place from 6.15pm. Admission £12. Photo ID will be needed for entry. Crafty Vintage has it all for mums this Mother’s Day. From gorgeous gifts and vintage treats, there’s everything all under one roof that’s guaranteed to make mums feel extra special and pampered. Plus, vintage vocals throughout the day too. It’s on Sunday at Holmes Mill, Clitheroe from 12pm until 5pm. Admission is free.